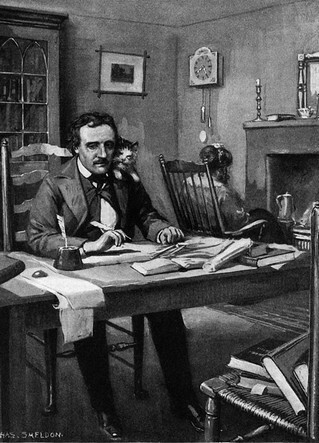 April 1841 Editing Again Poe begins as an editor at Graham's Magazine, where he works until May 1842. The magazine runs Poe's short story "The Murders in the Rue Morgue," the first-ever entry in a genre now known as the detective story. Poe left Burton's after about a year and found a position as assistant at Graham's Magazine. In June 1840, Poe published a prospectus announcing his intentions to start his own journal, The Stylus. Originally, Poe intended to call the journal The Penn, as it would have been based in Philadelphia, Pennsylvania. In the June 6, 1840 issue of Philadelphia's Saturday Evening Post, Poe bought advertising space for his prospectus: "Prospectus of the Penn Magazine, a Monthly Literary journal to be edited and published in the city of Philadelphia by Edgar A. Poe. "The journal was never produced before Poe's death. Around this time, he attempted to secure a position with the Tyler administration, claiming he was a member of the Whig Party. He hoped to be appointed to the Custom House in Philadelphia with help from President Tyler's son Robert, an acquaintance of Poe's friend Frederick Thomas. Poe failed to show up for a meeting with Thomas to discuss the appointment in mid-September 1842, claiming to be sick, though Thomas believed he was drunk. Though he was promised an appointment, all positions were filled by others. Graham's Magazine was a nineteenth century periodical based in Philadelphia established by George Rex Graham. Edgar Allan Poe became the editor of Graham's in February 1841 and soon was publishing the harsh critical reviews for which he became known. It was also where he first published "The Murders in the Rue Morgue", now recognized as the first detective story. After Poe left the journal, his successor was Rufus Wilmot Griswold, a man who bitterly disliked Poe. Graham's began rejecting Poe's submissions and passed up the chance to publish "The Raven". Graham left his magazine for a time in 1848 and it eventually ceased in 1858.